You can probably guess from the band name that Vomitchapel are not power metal. 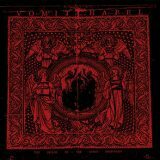 In the tradition of other filthmongers like Profanatica and Black Witchery, Vomitchapel (a one-man-band from Georgia, USA) make a very raw form of pounding blackened death metal that is designed to destroy all that is holy. Background grunts and groans over a blasting, single-minded drum attack and guitars that sound more like demonic moaning than musical instruments, The House Of The Lord Despoiled may be a one-dimensional attack, but it's an effective one. Moments such as Immaculate Defilement, where the attack slows to a teethgrinding doom pound, are especially spinechilling, and although the vocals initially sound laughable, give it a few tracks to make an impression and they become distinctly creepy. It's good that the atmospheric effect of this is so compelling, as the songs themselves are lacking - there's little to tell them apart, for one, and there's little to please the ear in terms of hooks or musicianship. But this sort of black metal isn't about that, it's about the atmosphere, and on that ground this is excellent. Take the crawling, snail-paced Vaginal Sepulchre, like something from a Bolt Thrower demo at first in slow, shuddering heaviness, before speeding into a bony dash. It's like being chased through a cave by some hideous abomination. Flesh For Your Lord has an effective breakdown partway through, its intense hatred taking a break before resuming twice as viciously. Carnal Hammer opens with a sample of some film, which jars ridiculously with the ensuing raw blizzard, and Gaping Perversion audibly has slight changes in tempo but does nothing different otherwise. All in all I'd say Vomitchapel are rawer than Profanatica, more eerie and atmospheric than Black Witchery. In some ways it's like a demo recording of the two bands collaborating, raw and evil. Certain to delight those who like this sort of thing, this isn't music to burn churches to so much as music to throw up on them to. Have to give mastermind Ghoat credit for getting the name right, even if you're not a fan of the style.